Acute-phase serum amyloid A (A-SAA) is a major component of the acute-phase response. A sustained acute-phase response in rheumatoid arthritis (RA) is associated with increased joint damage. A-SAA mRNA expression was confirmed in all samples obtained from patients with RA, but not in normal synovium. A-SAA mRNA expression was also demonstrated in cultured RA synoviocytes. A-SAA protein was identified in the supernatants of primary synoviocyte cultures, and its expression colocalized with sites of macrophage accumulation and with some vascular endothelial cells. It is concluded that A-SAA is produced by inflamed RA synovial tissue. The known association between the acute-phase response and progressive joint damage may be the direct result of synovial A-SAA-induced effects on cartilage degradation. Serum amyloid A (SAA) is the circulating precursor of amyloid Aprotein, the fibrillar component of amyloid deposits. In humans, four SAA geneshave been described. Two genes (SAA1 and SAA2) encode A-SAAand are coordinately induced in response to inflammation. SAA1 andSAA2 are 95% homologous in both coding and noncoding regions.SAA3 is a pseudogene. SAA4 encodes constitutive SAA and isminimally inducible. A-SAA increases dramatically during acute inflammation andmay reach levels that are 1000-fold greater than normal. A-SAA is mainlysynthesized in the liver, but extrahepatic production has been demonstrated inmany species, including humans. A-SAA mRNA is expressed in RA synoviocytes andin monocyte/macrophage cell lines such as THP-1 cells, in endothelial cells andin smooth muscle cells of atherosclerotic lesions. A-SAA has also beenlocalized to a wide range of histologically normal tissues, including breast,stomach, intestine, pancreas, kidney, lung, tonsil, thyroid, pituitary,placenta, skin and brain. To identify the cell types that produce A-SAA mRNA and protein,and their location in RA synovium. Rheumatoid synovial tissue was obtained from eight patientsundergoing arthroscopic biopsy and at joint replacement surgery. Total RNA wasanalyzed by reverse transcription (RT) polymerase chain reaction (PCR) forA-SAA mRNA. PCR products generated were confirmed by Southern blot analysisusing human A-SAA cDNA. Localization of A-SAA production was examined byimmunohistochemistry using a rabbit antihuman A-SAA polyclonal antibody.PrimaryRA synoviocytes were cultured to examine endogenous A-SAA mRNAexpression and protein production. A-SAA mRNA expression was detected using RT-PCR in all eightsynovial tissue samples studied. Figure 1 demonstratesRT-PCR products generated using synovial tissue from three representative RApatients. Analysis of RA synovial tissue revealed differences in A-SAA mRNAlevels between individual RA patients. In order to identify the cells that expressed A-SAA mRNA in RAsynovial tissue, we analyzed primary human synoviocytes (n = 2). RT-PCRanalysis revealed A-SAA mRNA expression in primary RA synoviocytes (n = 2; Fig. 2). The endogenous A-SAA mRNA levels detected inindividual primary RA synoviocytes varied between patients. These findings areconsistent with A-SAA expression in RA synovial tissue (Fig. 1). Glyceraldehyde-3-phosphate dehydrogenase (GAPDH) levelswere relatively similar in the RA synoviocytes examined (Fig. 2). A-SAA protein in the supernatants of primary synoviocytecultures from four RA patients was measured using ELISA. Mean values of acontrol and four RA samples were 77.85, 162.5, 249.8, 321.5 and 339.04 μg/l A-SAA, respectively, confirming the production of A-SAA protein by theprimary RA synoviocytes. Immunohistochemical analysis was performed to localizesites of A-SAA production in RA synovial tissue. Positive staining was presentin both the lining and sublining layers of all eight RA tissues examined (Fig.3a). Staining was intense and most prominent in the cellsclosest to the surface of the synovial lining layer. Positively stained cellswere evident in the perivascular areas of the sublining layer. In serialsections stained with anti-CD68 monoclonal antibody, positive staining ofmacrophages appeared to colocalize with A-SAA-positive cells (Fig.3b). Immunohistochemical studies of cultured primary RAsynoviocytes confirmed specific cytoplasmic A-SAA expression in these cells.The specificity of the staining was confirmed by the absence of staining foundon serial sections and synoviocyte cells treated with IgG (Fig. 3c). This study demonstrates that A-SAA mRNA is expressed in severalcell populations infiltrating RA synovial tissue. A-SAA mRNA expression wasobserved in all eight unseparated RA tissue samples studied. A-SAA mRNAexpression and protein production was demonstrated in primary cultures ofpurified RA synoviocytes. Using immunohistochemical techniques, A-SAA proteinappeared to colocalize with both lining layer and sublining layer synoviocytes,macrophages and some endothelial cells. The detection of A-SAA protein inculture media supernatants harvested from unstimulated synoviocytes confirmsendogenous A-SAA production, and is consistent with A-SAA mRNA expression andtranslation by the same cells. Moreover, the demonstration of A-SAA protein inRA synovial tissue, RA cultured synoviocytes, macrophages and endothelial cellsis consistent with previous studies that demonstrated A-SAA production by avariety of human cell populations. The RA synovial lining layer is composed of activated macrophagesand fibroblast-like synoviocytes. The macrophage is the predominant cell typeand it has been shown to accumulate preferentially in the surface of the lininglayer and in the perivascular areas of the sublining layer. Nevertheless, ourobservations strongly suggest that A-SAA is produced not only by synoviocytes,but also by synovial tissue macrophage populations. Local A-SAA proteinproduction by vascular endothelial cells was detected in some, but not all, ofthe tissues examined. The reason for the variability in vascular A-SAA stainingis unknown, but may be due to differences in endothelial cell activation,events related to angiogenesis or the intensity of local inflammation. The value of measuring serum A-SAA levels as a reliable surrogatemarker of inflammation has been demonstrated for several diseases including RA,juvenile chronic arthritis, psoriatic arthropathy, ankylosing spondylitis,Behçet's disease, reactive arthritis and Crohn's disease. Ithas been suggested that serum A-SAA levels may represent the most sensitivemeasurement of the acute-phase reaction. In RA, A-SAA levels provide thestrongest correlations with clinical measurements of disease activity, andchanges in serum levels best reflect the clinical course. A number of biologic activities have been described for A-SAA,including several that are relevant to the understanding of inflammatory andtissue-degrading mechanisms in human arthritis. A-SAA induces migration,adhesion and tissue infiltration of circulating monocytes and polymorphonuclearleukocytes. In addition, human A-SAA can induce interleukin-1β, interleukin-1 receptor antagonist and soluble type II tumour necrosis factorreceptor production by a monocyte cell line. Moreover, A-SAA can stimulate theproduction of cartilage-degrading proteases by both human and rabbitsynoviocytes. The effects of A-SAA on protease production are interesting,because in RA a sustained acute-phase reaction has been strongly associatedwith progressive joint damage. The known association between the acute-phaseresponse and progressive joint damage may be the direct result of synovialA-SAA-induced effects on cartilage degradation. In contrast to noninflamed synovium, A-SAA mRNA expression wasidentified in all RA tissues examined. A-SAA appeared to be produced bysynovial tissue synoviocytes, macrophages and endothelial cells. Theobservation of A-SAA mRNA expression in cultured RA synoviocytes and human RAsynovial tissue confirms and extends recently published findings thatdemonstrated A-SAA mRNA expression in stimulated RA synoviocytes, but not inunstimulated RA synoviocytes. Detection of A-SAA mRNA expression in inflamed human synovialtissue by RT-PCR. Analysis of total RNA from rheumatoid synovium (n= 3, lanes 1-3) was performed using primers for human A-SAA and GAPDH. The 500bp molecular weight marker (MW) is highlighted. Detection of A-SAA mRNA expression in primary human synoviocytes.RT-PCR analysis was performed using total RNA from individual rheumatoidprimary synoviocytes with primers to human A-SAA and GAPDH (lanes 1, 2). The500 bp molecular weight marker (MW) is highlighted. Immunohistological analysis of RA synovial membrane. 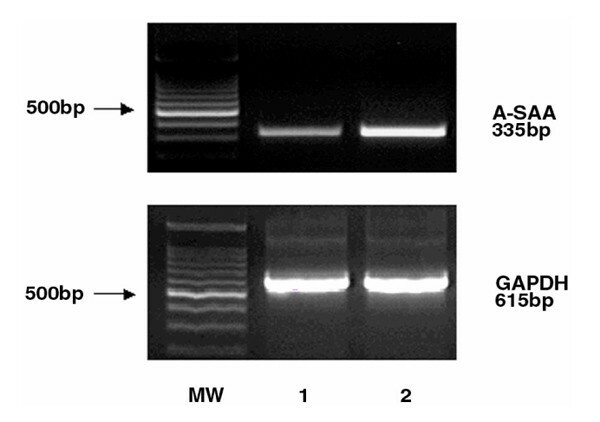 Serial tissuesections were stained with (a) antibody to A-SAA, (b) anti-CD68and (c) IgG. A-SAA-positive cells are seen in the surface of the lininglayer and in the perivascular areas. Some vascular endothelial cells are weaklypositive (a). CD68-positive cells are seen throughout the lining layerand in the perivascular areas of the sublining layer. Vascular endothelialcells are negative (b). No staining was observed in the control sections(c). SAA is the circulating precursor of amyloid A protein, the fibrillar component of amyloid deposits [1,2]. Four human SAA genes have been described. Two genes (SAA1 and SAA2) encode A-SAA and are coordinately induced in response to inflammation. SAA1 and SAA2 are 95% homologous in both coding and noncoding regions. SAA3 is a pseudogene. SAA4 encodes constitutive SAA and is minimally inducible. A-SAA increases dramatically during acute inflammation and may reach levels that are 1000-fold greater than normal [3,4]. A-SAA is mainly synthesized in the liver , but extrahepatic production has been demonstrated in many species, including in humans. A-SAA mRNA is expressed in RA synoviocytes  and in monocyte/macrophage cell lines such as THP-1 cells (Human monocyte cell line American Type Culture Collection Tumor Immunology bank 17 - ATCC TIB) , in endothelial cells and smooth muscle cells of atherosclerotic lesions . A-SAA has also been localized to a wide range of histologically normal tissues, including breast, stomach, intestine, pancreas, kidney, lung, tonsil, thyroid, pituitary, placenta, skin and brain . Synovial membrane samples were obtained following informed consent from patients with RA at arthroscopic biopsy (n = 7) or joint replacement surgery (n = 1). RA was diagnosed according to the criteria of the American College of Rheumatology . Histologically normal synovium (n = 1) was obtained from the knee joint of a patient undergoing lower limb amputation. Synovial cells were obtained by enzymatic digestion of synovial membrane with 1mg/ml collagenase type I (Worthington Biochemical, Freehold, NJ, USA) in RPMI (GibcoBRL, Paisley, UK) for 4 h at 37°C in 5% carbon dioxide. Dissociated cells were plated in RPMI supplemented with 10% foetal calf serum (GibcoBRL), 10 ml of 1 mmol/l HEPES (GibcoBRL), penicillin (100 units/ml), streptomycin (100 units/ml) and fungizone (0.25 μg/ml). The cells were grown to confluency (approximately 10days) at 37°C in a 5% carbon dioxide atmosphere, then harvested with trypsin and passaged. Synoviocytes were found to be morphologically homogenous fibroblast-like cells and were used between the third and seventh passage. To confirm synoviocyte cultures were not contaminated by monocytes, staining for the monocyte marker CD14 was carried out. Cells were placed in serum-free medium 24 h before total RNA extraction. Total RNA, isolated from freshly obtained synovial biopsies or cultured primary synoviocytes, was converted by RT into cDNA. For each total RNA sample, the following materials were used for RT at 42°C for 50 min: 1 μg total RNA and 200units SuperscriptII (GibcoBRL); RT buffer as supplied; 100 mmol/l dithiothreitol, 40units RNasin Ribonucleic Inhibitor (Promega, Madison, WI, USA); 1.25 mmol/l each of dATP, dCTP, dGTP and dTTP; and 500ng of oligo dTs. PCR was performed with the following materials: 2.0 μl cDNA; 1.25 mmol/l of each of dATP, dCTP, dGTP and dTTP; 2.5 units AmpliTaq (Perkin Elmer, Brachburg, NJ,USA); 2.5 mmol/l MgCl2 (GAPDH) and 2.0 mmol/l MgCl2(A-SAA); 2.5 μl 10 ×PCRII buffer (Perkin Elmer) and 20 ng of each specific PCR primer pair in a 25 μl total volume. Specific primers for human A-SAA were used to amplify a 335 base-pair (bp) A-SAA product: sense primer (5' -AAG CTT CTT TCC GTT CCT TGG-3') and antisense primer(5' -GAG AGC AGA GTG AAG AGG AAG C-3'). The A-SAA primers used span an intron. Thus, the PCR generates an unequivocally RNA-derived band, based on its size. GAPDH primers were designed to generate a 635-bp product: sense primer (5' -CCA CCC ATG GCA AAT TCC ATG GCA-3') and antisense primer (5' -TCT AGA CGG CAG GTC AGG TCC ACC-3'). After preincubation (94°C, 10 min) each PCR sample underwent a 35-cycle amplification regimen of denaturation (94°C, 1 min), primer annealing (60-56°C, 1 min) and extension (72°C, 1 min), with a final extension (72°C, 10 min) in a thermal cycler (MJ Research, Inc, Cambridge, MA, USA). Total RNA was isolated (RNeasy, Qiagen, Crawley, UK) from cultured primary synoviocytes and quantified by ultraviolet absorption. Of total RNA, 10 μg was electrophoresed on a standard northern gel and transferred onto a nylon membrane (BioRad, Richmond, CA, USA). The human A-SAA cDNA  was radiolabelled to a high specific activity using [α-32P] dCTP and a random primer labelling system (Promega). All membranes were probed under high stringency conditions. Blots were exposed to film at -80°C using intensifying screens and autoradiographic intensity was quantified using an imaging densitometer. PCR products generated were run on a 2% agarose gel and transferred onto a nylon membrane (BioRad) using standard procedures. Human A-SAA and GAPDH cDNA probes were radiolabelled to a high specific activity using [α-32P] dCTP and a random labelling system (Promega). All membranes were probed under high stringency conditions. Blots were exposed to film at -80°C using intensifying screens. A-SAA protein levels were measured using a sandwich enzyme immunoassay (Biotrin International, Dublin, Ireland). Supernatants derived from primary RA synoviocyte cultures were harvested. Samples were added to a microtitre plate, which was precoated with IgG (anti-A-SAA) and incubated for 1 h. The microtitre plate was washed and IgG (anti-A-SAA)-horseradish peroxidase conjugate added. After 1 h incubation and plate washing, substrate was added. The absorbance was measured at 450nm, using 650nm as a reference. Colour intensity is directly proportional to the amount of A-SAA in the sample. The detection limit of the assay was determined as 2.25 μg/l . Synovial tissue was placed in the cryopreservative embedding media OCT compound (Tissue Tek, Sakura, Finetek, Europe BV, Zoeterwoude, The Netherlands) and immediately frozen in liquid nitrogen. Sections (7 μ m) were cut on a microtome (Microm HM 505N, GmbH 69190 Walldorf, Germany), placed on glass slides coated with 2% 3-amino-propyl-triethoxy-silane (Sigma-Aldrich Ireland Ltd, Dublin, Ireland) in acetone and dried overnight at room temperature. Isolated RA synoviocytes were trypsinized and placed into a six-well plate with apyrogenic cell culture coverslips. Once grown to confluency, the medium was removed and the cells were treated with methanol for 15 min. Synoviocytes were stained essentially as described for the tissue sections. Tissue sections were allowed to reach room temperature, fixed in acetone, air-dried and incubated for 1 h at room temperature with blocking serum (Vectastain Rabbit Elite Kit, Vector Laboratories Ltd, Peterborough, UK). The slides were incubated with avidin for 15 min, rinsed and then incubated with biotin for 15 min. The primary polyclonal antibody for A-SAA (1:1200-1:1600; rabbit antihuman) was incubated for 1 h at room temperature. Secondary antibodies (antirabbit and antimouse; Vectastain) were prepared and added to the relevant sections and incubated for 30 min. The secondary antibody was washed off and the slides were incubated with Avidin:Biotinylated enzyme complex solution for 30 min and incubated for 6 min with 3,3' -diaminobenzidine and counterstained in haemotoxylin stain for 1 min. RT-PCR analysis was employed to examine peripheral A-SAA mRNA expression in RA synovial membrane. Endogenous A-SAA mRNA expression was detected in all eight RA synovial tissue samples studied. Figure 1 demonstrates RT-PCR products generated using synovial tissue from three representative RA patients. The specificity of the cDNAs generated were confirmed by Southern blot analysis using cDNA probes for human A-SAA and GAPDH (Fig. 4). RA synovial tissue samples examined showed increased levels of A-SAA mRNA when compared with normal synovium (Fig. 4; lane 1). Analysis of RA synovial tissue revealed differences in A-SAA mRNA levels between individual RA patients. Expression levels of the house-keeping gene (GAPDH) were similar in all patients. In order to identify the cells that express A-SAA mRNA in RA synovial tissue, we analyzed primary human synoviocytes. Northern blot analysis did not detect endogenous A-SAA mRNA in primary unstimulated RA synoviocytes (Fig. 5a; lane 1). In contrast, abundant A-SAA mRNA levels were observed in KB oral epidermal cells [Human Epidermoid, carcinoma; American Type Culture Collection Certified cell lines (ATCC CCL) 17] stimulated with interleukin-1 (10 ng/ml) and interleukin-6 (10 ng/ml) and dexamethasone (10-6 mol/l) for either 24 or 48 h (Fig. 5a; lanes 2 and 3). RT-PCR analysis revealed A-SAA mRNA expression in primary RA synoviocytes (n = 2; Fig. 2). The sensitivity of the PCR technique was greatly improved by the utilization of the ultrapure AmpliTaq gold polymerase (Perkin Elmer). The endogenous A-SAA mRNA levels detected in individual primary RA synoviocytes varied between patients. These findings are consistent with A-SAA expression in RA synovial tissue (Fig. 1). GAPDH levels were relatively similar in the RA synoviocyte cells examined (Fig. 2). 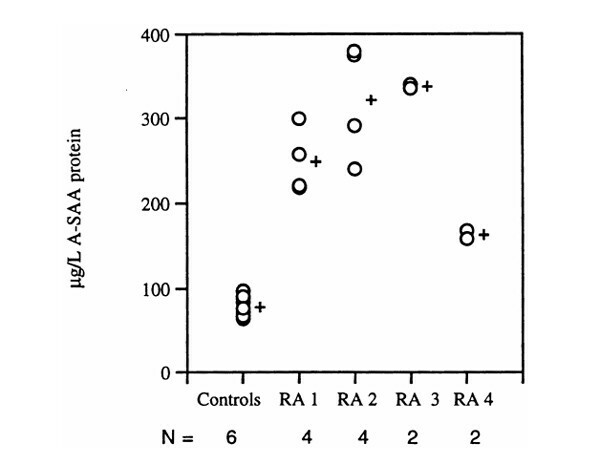 A-SAA protein was measured by ELISA in the supernatants of primary synoviocyte cultures from four RA patients. Supernatants were separated from cell cultures between the third and seventh passages. Mean values of control and four RA samples of 77.85, 162.5, 249.8, 321.5 and 339.04 μg/l A-SAA, respectively, were obtained, confirming the production of A-SAA protein by the primary RA synoviocytes (Fig. 6). Immunohistochemical analysis was performed in order to localize sites of A-SAA production in RA synovial tissue.Positive A-SAA staining was observed in all eight RA tissues examined. Positive staining was present in both the lining and sublining layers of the tissue (Fig. 3a). In the synovial lining layer, staining was usually intense and most prominent in the cells closest to the surface. In the sublining layer positively stained cells were also prominent in the perivascular areas. In serial sections stained with anti-CD68 monoclonal antibody, positive staining of some macrophages appeared to colocalize with A-SAA-positive cells, particularly those in the lining layer surface and the perivascular areas (Fig. 3b). In some sections the vascular endothelium also demonstrated positive A-SAA staining, but this finding was not consistent. Immunohistochemical studies of cultured primary RA synoviocytes confirmed specific cytoplasmic A-SAA expression in these cells (Fig. 7a). The specificity of the staining was confirmed by the absence of staining found on serial sections (Fig. 3c) and synoviocytes (Fig. 7b) treated with IgG. Detection of A-SAA mRNA expression in inflamed human synovialtissue by RT-PCR. Southern blot analysis of A-SAA and GAPDH cDNAs generatedusing total RNA from normal human synovium (lane 1) and rheumatoid synovium(lane 2). 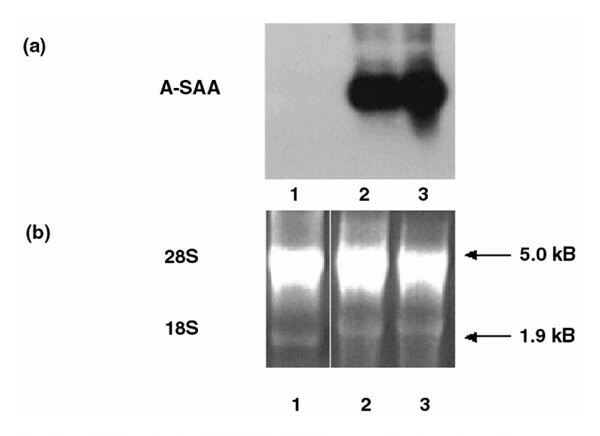 Northern blot analysis of A-SAA mRNA expression in primary humansynoviocytes. (a) Total RNA isolated from primary synoviocyte cultures(lane 1), and KB oral epidermal cells stimulated for 24 h (lane 2) and 48 h (lane3) with 10 ng/ml IL-1, IL-6 and dexamethasone (10-6 mol/l). (b) Agarose gel electrophoresis demonstrating the integrity of total RNAused for Northern analysis. Levels of A-SAA detected in culture primary RA synoviocytesupernatants. Mean values of control and individual RA samples (RA1-RA4) areindicated. N, number of samples measured per group. Immunohistochemical analysis of RA synoviocytes. (a) Positive cytoplasmic staining was observed in RA synoviocytes stained withanti-A-SAA antibody. (b) The specificity of staining was confirmed usingsynoviocytes stained with isotype-matched IgG. The aim of the present study was to examine synovial A-SAA production in RA and to identify the cell populations expressing A-SAA in inflamed tissue. In contrast to non-inflamed synovium, A-SAA mRNA expression was identified in all RA tissues examined. A-SAA appeared to be produced by synovial tissue synoviocytes, macrophages and endothelial cells. This study demonstrates that A-SAA mRNA is expressed in several cell populations infiltrating RA synovial tissue, but not in normal synovial tissue. First, by employing RT-PCR, A-SAA mRNA expression was observed in all eight unseparated RA tissue samples studied. Second, A-SAA mRNA expression and protein production was demonstrated in primary cultures of purified RA synoviocytes. Finally, using immunohistochemical techniques, A-SAA protein appeared to colocalize with both lining layer and sublining layer synoviocytes, macrophages and some endothelial cells. The observation of A-SAA mRNA expression in cultured RA synoviocytes confirms and extends the recent findings reported by Kumon et al , which demonstrated A-SAA mRNA expression in stimulated RA synoviocytes, but not in unstimulated RA synoviocytes. The demonstration of A-SAA production in unstimulated RA synoviocyte cultures in that study is probably due to the increased sensitivity of the analytical methods employed. Additionally, the detection of A-SAA protein in culture media supernatants harvested from unstimulated synoviocytes confirms endogenous A-SAA production and is consistent with A-SAA mRNA expression and translation by the same cells. Moreover, the demonstration of A-SAA protein in RA synovial tissue, RA cultured synoviocytes, macrophages and endothelial cells is consistent with previous studies [8,9,12] demonstrating A-SAA production by a variety of human cell populations. The RA synovial lining layer is composed of activated macrophages and fibroblast-like synoviocytes . The macrophage is the predominant cell type and it has been shown  to accumulate preferentially in the surface of the lining layer. Macrophages also accumulate in the perivascular areas of the sublining layer . As demonstrated in the present study, not all lining layer and sublining layer macrophages appeared to produce A-SAA. Futher studies of isolated synovial tissue macrophages, and immunohistological studies employing double-labelling techniques, will elucidate this observation. Nevertheless, the observations reported in this study strongly suggest that A-SAA is produced not only by synoviocytes, but also by synovial tissue macrophage populations. Local A-SAA protein production by vascular endothelial cells was detected in some, but not all, of the tissues examined.The reason for the variability in vascular A-SAA staining is unknown, but this variability may be due to differences in endothelial cell activation, events relating to angiogenesis or the intensity of local inflammation. The value of measuring serum A-SAA levels as a reliable surrogate marker of inflammation has been demonstrated  in several diseases including RA, juvenile chronic arthritis, psoriatic arthropathy, ankylosing spondylitis, Behçet's disease, reactive arthritis and Crohn's disease. It has been suggested  that serum A-SAA levels may represent the most sensitive measurement of the acute-phase reaction. Cunnane et al  quantified serum A-SAA levels in 140 patients with various inflammatory joint diseases with duration of less than 2 years, and demonstrated significant correlations with other acute-phase measurements such as C-reactive protein and the erythrocyte sedimentation rate. The magnitude of the A-SAA response was greatest, and the highest levels occurred in RA. In RA, A-SAA levels provided the strongest correlations with clinical measurements of disease activity, and changes in serum levels best reflected the clinical course. The principal biologic function of A-SAA is not known [1,2]. A number of biologic activities have been described, however, including several that are relevant to the understanding of inflammatory and tissue degrading mechanisms in human arthritis. A-SAA induces migration, adhesion and tissue infiltration of circulating monocytes and polymorphonuclear leucocytes . In addition, human A-SAA can induce interleukin-1β, interleukin-1 receptor antagonist and soluble type II tumour necrosis factor receptor production by a monocyte cell line . Moreover, A-SAA can stimulate the production of cartilage-degrading proteases by both human and rabbit synoviocytes [19,20]. The effects of A-SAA on protease production are particularly interesting because, in RA, a sustained acute-phase reaction has been strongly associated with progressive joint damage . The known association between the acute-phase response and progressive joint damage may be the direct result of synovial A-SAA-induced effects on cartilage degradation. Rosemary O'Hara is supported by a grant from the Health Research Board of Ireland; Evelyn P Murphy is the Pfizer Newman Scholar, University College, Dublin. Synovial tissue samples were provided by Eithne Murphy, Leanne Stafford and David Kane. Nicola Cassidy prepared tissue sections for immunohistochemical analysis. Emer Cunningham (Biotrin International, Dublin, Ireland) provided the A-SAA ELISA kits as a gift and the assays were performed by John Paul Doran, during a Summer Studentship sponsored by the Health Research Board of Ireland.